Arval is one of the UK’s leading car leasing companies, with excellent customer service and customer reviews to match. We ensure we consistently offer a wide range of vehicles to suit everyone’s needs. And if you’re looking for a Lexus, we’ve got it covered. When Eiji Toyoda first set his sights on creating the ‘world’s best car’ back in 1983, we wonder if he ever envisioned the luxury car giant, Lexus that he was about to create. Since then, Lexus has established itself as a luxury car brand renowned for quality and reliability and now ranks among the top 10 largest Japanese brands. The entry level Lexus CT is a luxury hybrid hatchback. It’s a refreshing alternative to more mainstream cars in its class such as the BMW 1 Series, Audi A3 or Mercedes A-Class. The hybrid powertrain means emissions are just 82g/km, meaning it’s a great choice for drivers looking to lease a car with distinctive looks and a low BiK rating (just 17%). The recently launched IS saloon acts as fresh and welcome competition in the executive car segment. Compared to the BMW 3-Series and Audi A4, the IS may not feel quite so premium but its exclusivity can’t be beaten as there aren’t nearly as many on UK roads. And, for those who are in the market for an executive car lease but want to keep the company car tax down, they shouldn’t rule out the IS with 65.7mpg on the combined cycle and emissions of 101g/km. Sitting above the IS is the Lexus GS, an efficient hybrid saloon that’s both comfortable, reliable and designed to take on the established A6, 5 Series and E-Class. 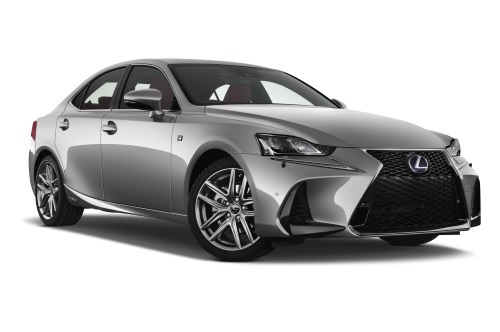 Majoring on style, the GS range is available as a 300h, 450h or a range topping 5.0 litre V8 outputting 477 bhp available in the GS F.
Going head to head with the Audi A5, Mercedes C-Class Coupe, and the BMW 4 Series, is the RC. The RC is a distinct two-door, four-seater coupe powered by a 2.5 litre hybrid engine, offering 180hp yet producing just 113 g/km of CO2, thanks to its sophisticated hybrid technology. At the top of the performance range is the LC 500 coupe, bursting with state-of-the-art extras and the latest technology on offer from the Japanese brand. Meanwhile, for those seeking extreme levels of luxury and refinement, the Lexus LS is a large saloon offering a high spec for executive drivers, rivalling the Mercedes S-Class and BMW 7 Series. Lexus also offers a range of luxury SUVs such as the NX and RX. The NX is the smaller of the two SUVs on offer whilst the RX is the larger model with a higher basic specification. Both SUVs offer impressively low CO2 emissions, which make them a popular choice for company car drivers looking to lease an SUV with a low BiK rating. With flexible leasing packages and a full customer support team to help you through your lease, don’t hesitate to find out more about leasing a Lexus with us. To discover more about the Lexus range and other available leasing products, take a look at our leasing deals, call us on 0345 266 5602.